Since 2016, Akasha Wellness Retreat has welcomed guests from all over the world offering curated themed retreats to empower and inspire their wellness journeys. 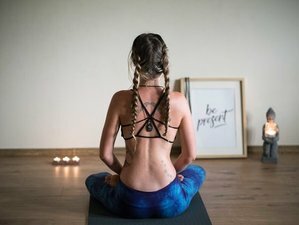 The Akasha Teacher Training program blends yoga traditions from the east and west, integrating both into a practical and unique method that combines vinyasa flow alignment and skillful sequencing with the emphasis on being able to curate, lead and teach your own yoga retreat programme. During this retreat, you will stay at Akasha Retreat. Its large open lounge and diner allows all guests, teachers, and friends to come together and socialize, laugh, play, and explore creative pursuits together. The gorgeous mountain views, garden, and terraces are the kindest gift nature has given them, and they in return offer them to you. Each of the guest bedrooms is special and each has handmade decorative items, a blend of modern romantic with natural elements from the environment. Science and the art of sequencing; class, retreat themes, and experience building - curating classes with a touch of personal creativity through unique personal sequences, "peak pose" building and flows that give an all-rounded experience. Beyond the physical practice of yoga. Yoga history and philosophy, Sanskrit names of postures, principles of Ayurveda -the origins and evolution of yoga, applications to modern lifestyles on and off the mat. You will be served with three daily healthy plant-based meals. All meals are organic and produced locally, nutritionally balanced, varied and delicious! Unlimited access to spa facilities, sauna, and jacuzzi. Akasha Wellness Retreat is a center for conscious living offering yoga and meditation retreats in Transylvania, Romania throughout the year, and in Goa, India.